joyn or die? forget about KakaoTalk and Anipang? 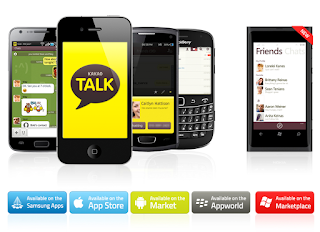 Remember last year, when KakaoTalk celebrated its 10 millionth user (see "Kakao Talk of the day")? Well, 1000 days after launch, the Korean player claims 70 M users in 13 languages, with daily averages of 27 M users, 43 mn per user, and 4.2 billion messages. Even if Skype remains far ahead with its 280 M users (and the support of Microsoft* - whatever that's worth nowadays), Kakao Inc. has already become a global phenomenon - maybe level 5 on Gangnam Style scale - , and remains as ambitious as ever. The way Anipang on KakaoTalk turned into an instant hit in the competitive game apps arena** probably scared the heck out of pure players (messaging services, VoIP...), not to mention much bigger netcos, starting at home with Daum and Naver, two giants on the Korean market who've - so far - failed to reach international recognition. Note that Kakao Inc. founder KIM Beom-soo is not an outsider: he created Hangame Communications, Inc., and headed NHN after the merger with Naver. Even top players are paying attention. Sundaytoyz (Anipang's developer) is not Rovio, and Kakao is not Facebook, but I bet many people in Menlo Park start wondering what kind of value the Kakao platform will aggregate after games. And if Big G can leverage its superiority in searches to boost Google Voice (and counter Apple's Siri), the brand itself is not exactly a success. Of course, the most nervous of all coopetitors are the MNOs, who see their customers use KakaoTalk for their calls and messages, and their own networks, even LTE-enabled, glogged with that booming data traffic. No wonder all 3 Korean cellcos decided to implement joyn, the GSMA's "Rich Communication Services" platform. To start with, the "joyn" logo is the perfect anti-KakaoTalk: a double black on yellow speech bubble to counter a single yellow on black speech bubble. And RCS brings what operators who cooperate do best: interoperability. As the GSMA puts it in its sales pitch, the solution "delivers an experience beyond voice and SMS by providing them with instant messaging or chat, live video and file sharing across any device, on any network, with all the enabled contacts in their address book". But first, the GSMA must convince its own customers, the MNOs, to implement the solution. Everybody must be on board for the promise to be delivered. Your consumers are hungry for access to the entertainment and interaction offered by RCS-based apps. Agile and innovative, Over The Top (OTT) providers are exploiting the massive penetration of Smartphones by developing appealing rich communication apps available at little or no cost to the consumer. Research conducted by one operator discovered a direct link between the penetration rate of cross-platform messaging services and the reduction of outgoing SMS traffic. Without RCS, the decline of voice messaging is likely to be next, as consumers increasingly engage with alternative IP based voice solutions. Once consumers start using an OTT app service, that offering becomes, for them, the lead brand for communications services. Operators remain more competitive by responding more rapidly to consumers’ expectations and behaviour, and by using RCS to enhance the value of their network and bring richer calls to their consumers." And those most dramatic final words: "Act now before it’s too late - Implement RCS today!" Stop pulling your hair out, try this air lotion and stop the airtime loss. We don't guarantee return of love. And be quick: the end is nigh. * see "Skype keeps moving, Google googling"